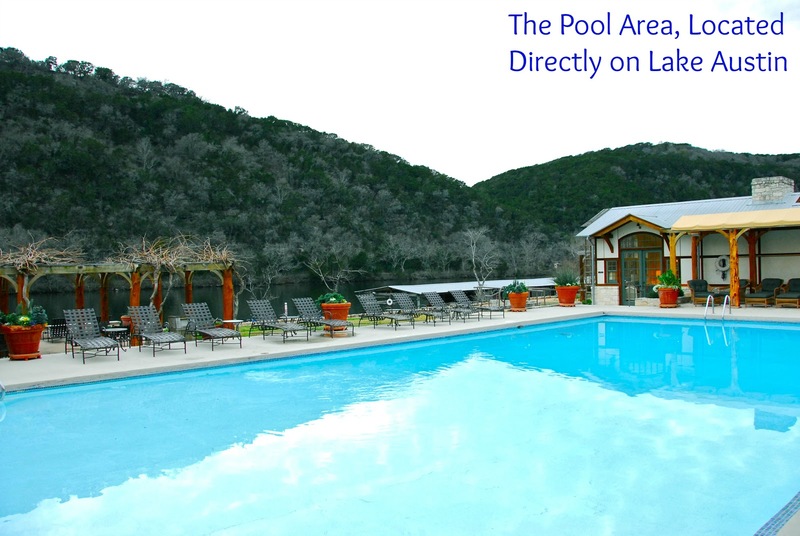 Michael and I recently spent a relaxing overnight stay at the award-winning Lake Austin Spa Resort. 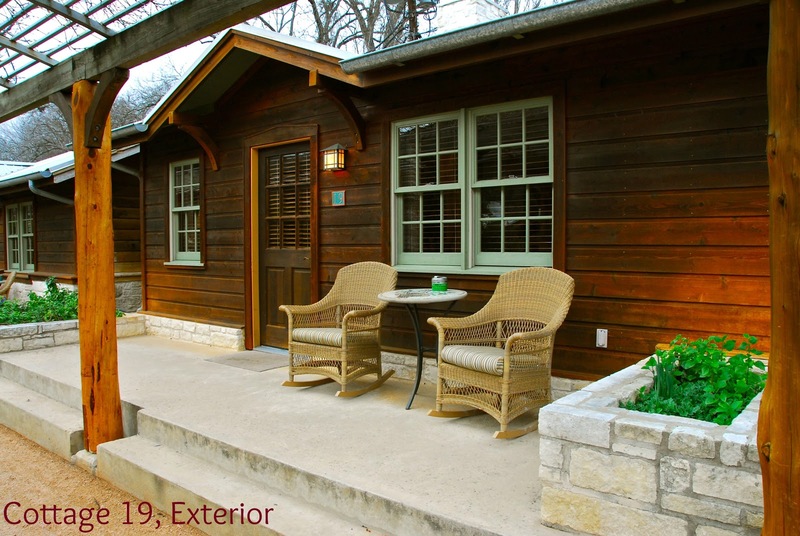 This peaceful, upscale resort is located about 30 minutes from Downtown Austin, directly on Lake Austin. 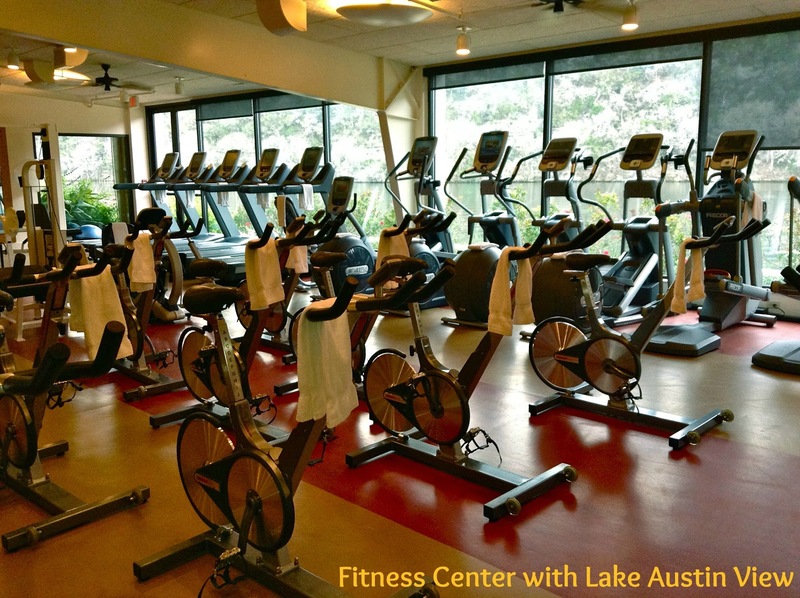 Lake Austin Spa Resort was recently named to the Conde Nast 2013 Gold List's Platinum Circle, and it's also recognized as one of the premier destination resort spas in the United States. They offer a wide variety of indoor and outdoor activities, exercise classes, a workout room, and healthy gourmet dining...all in a gorgeous setting! We arrived on a Sunday afternoon and were warmly greeted by the front desk staff. We were directed to a lovely sitting room with a beautiful Lake Austin view. After a few minutes, one of the staff members gave us a personal tour of the property. After our tour, we were escorted to our cabin for the evening. Cabin 19 is located directly across the parking area from the main building, where meals are served and the workout room and boutique are located. We loved how beautifully appointed our cabin was! It featured high ceilings with lots of light...and plenty of room. We had a large flat-screen television and a small fireplace. 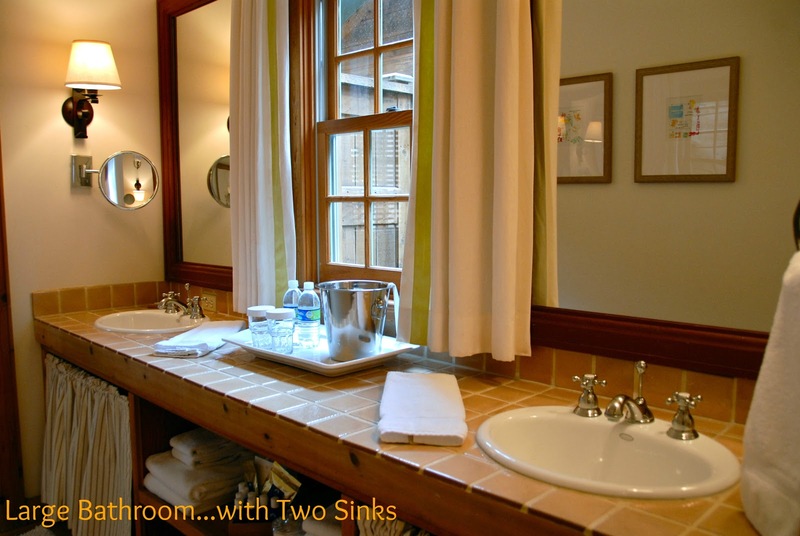 It also featured a large bathroom, complete with two vanity areas and a jetted tub. Not only was our cabin gorgeous, it came with a private backyard garden...complete with a huge hot tub! The cabin was so lovely that it was tempting to just order room service and spend the evening in our gorgeous garden oasis. However, we also wanted to spend some time walking around the grounds before the Sun set. We loved how beautifully manicured the grounds were...and how nicely the natural landscape was integrated into the property. We couldn't help but notice how quiet and relaxing the environment was. In fact, cell phones aren't allowed outside of the cabins to preserve the tranquility of the atmosphere. We enjoyed walking around and seeing the pool area, the herb garden, and the gorgeous lake view. All of the walking around on the grounds worked up an appetite, so we headed to the dining room for a healthy spa dinner. 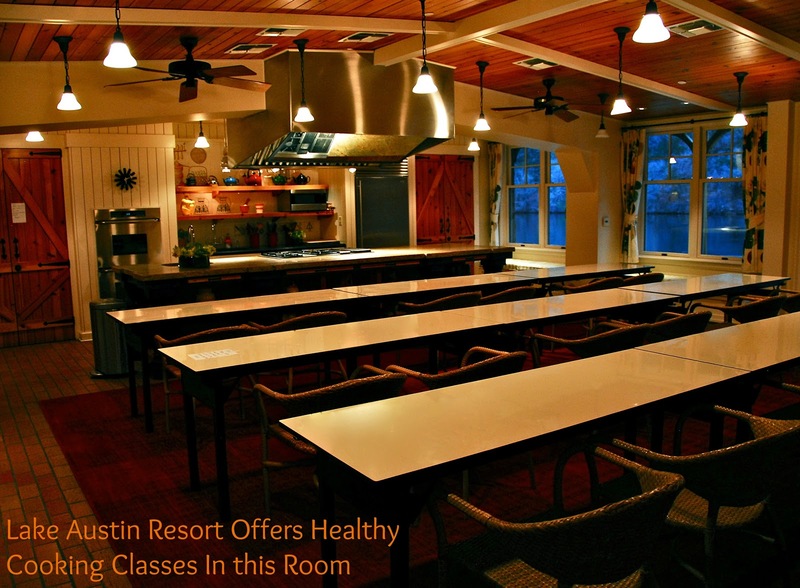 Before we entered the dining room, we took a few minutes to visit the workout room and the kitchen classroom, where a variety of renowned chefs provide healthy cooking classes. Both rooms featured more gorgeous views of the scenery outside. 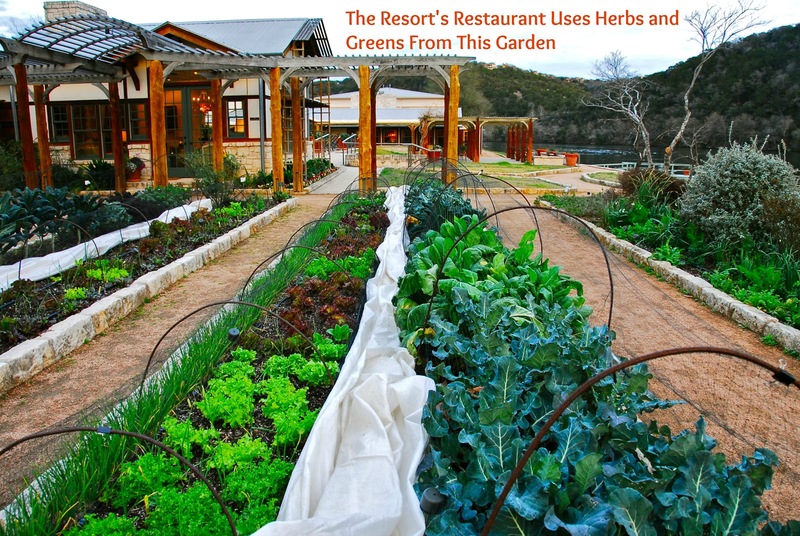 Lake Austin Spa Resort takes a "healthy meets gourmet" approach to dining. 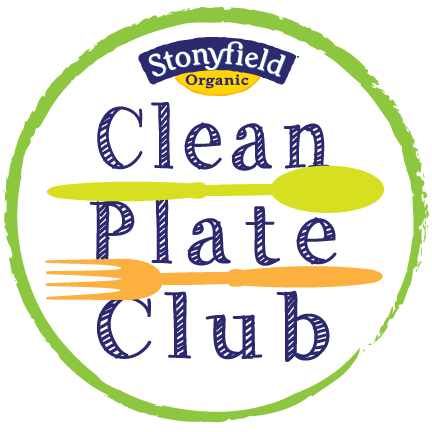 All menu items are healthy and portion controlled, but they don't skimp on flavor! We had a dinner that included an appetizer, salad, entree, and a shared dessert trio. The total calorie count for my meal was about 700 calories, including dessert. The food was perfectly prepared, light, and flavorful. The portion sizes were perfect for feeling full without being overly stuffed. 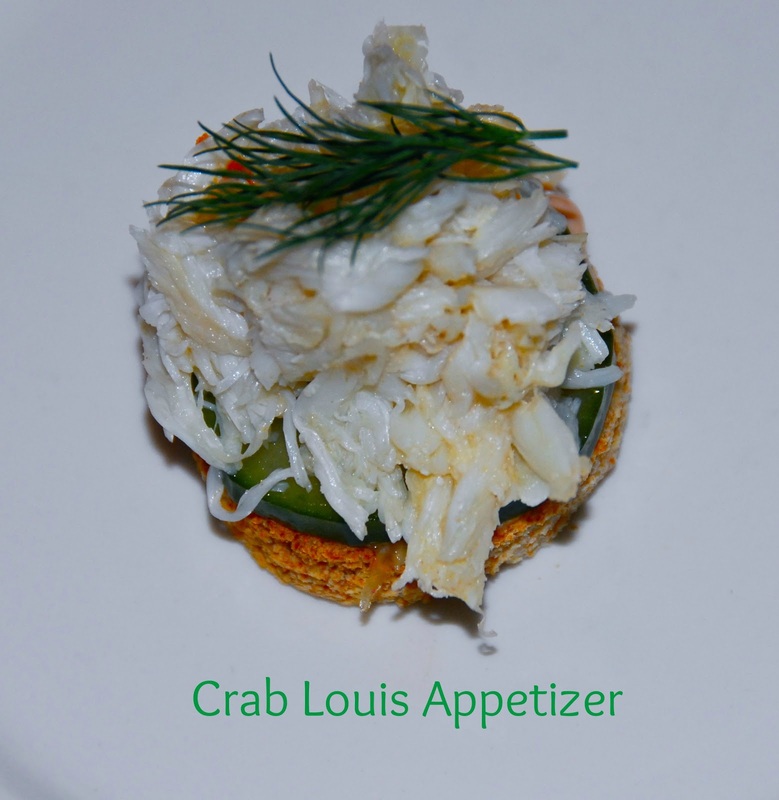 We started with two appetizers: Little Crab Cake Souffle and Crab Louis. 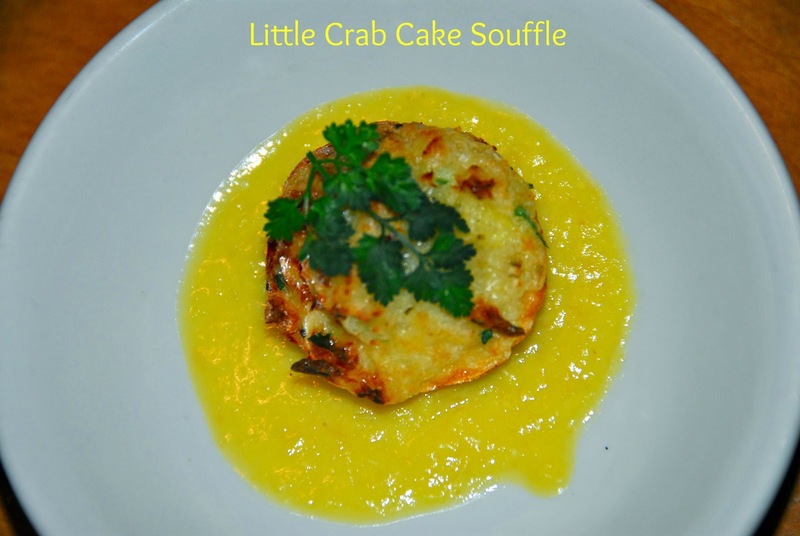 The Crab Cake Souffle was light and flavorful, served in a pool of sweet corn sauce. 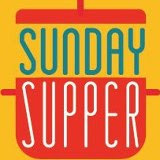 The Crab Louis featured a crunchy whole wheat toast round topped with a cucumber, crab, and chile aioli. Next up was the salad course. 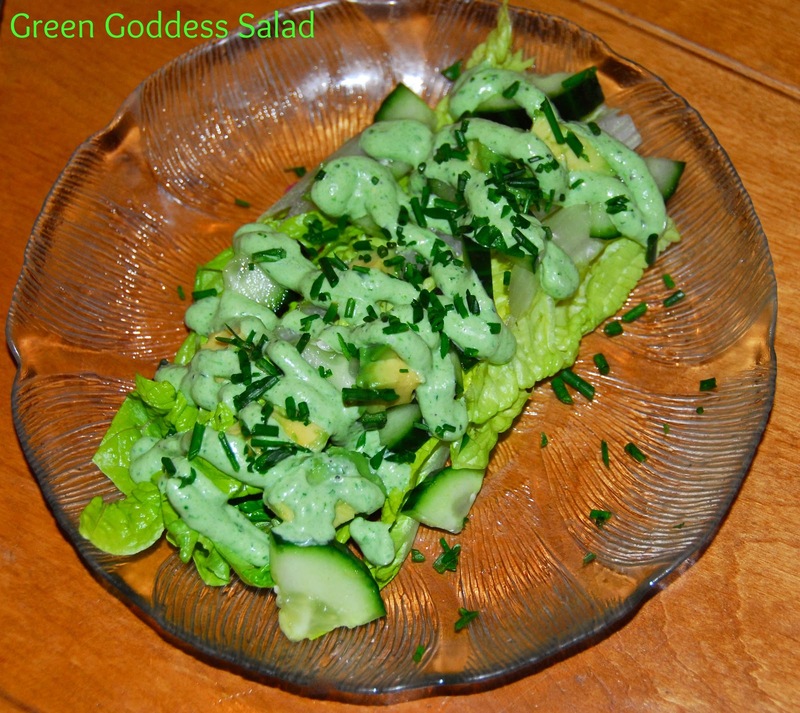 I opted for a Green Goddess Salad that featured romaine, cucumber, avocado, fresh herbs from their garden, and Green Goddess dressing. It was so good...crunchy and creamy, with a nice garlic kick. Michael opted for the Salad with Marinated Figs. 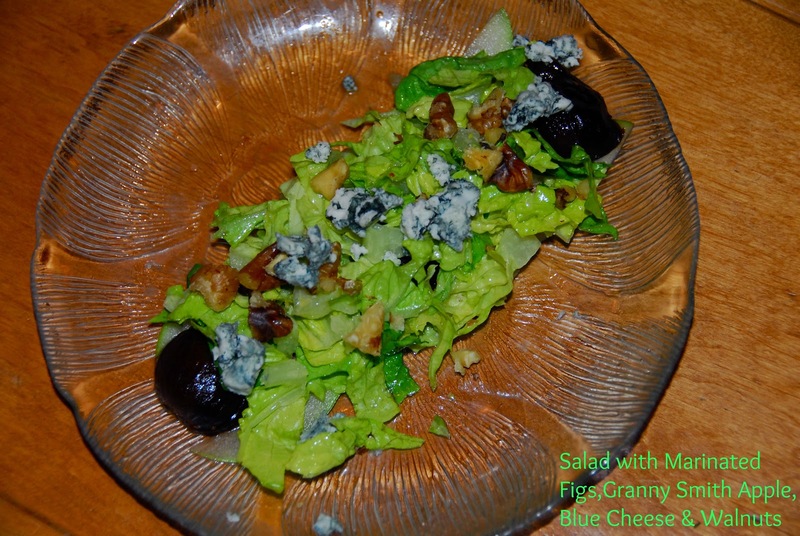 In addition to the figs, it also had Granny Smith apple, walnuts, blue cheese, and a mustard vinaigrette. Michael enjoyed the different textures and flavors and said they worked very well together. Our entrees came out next. 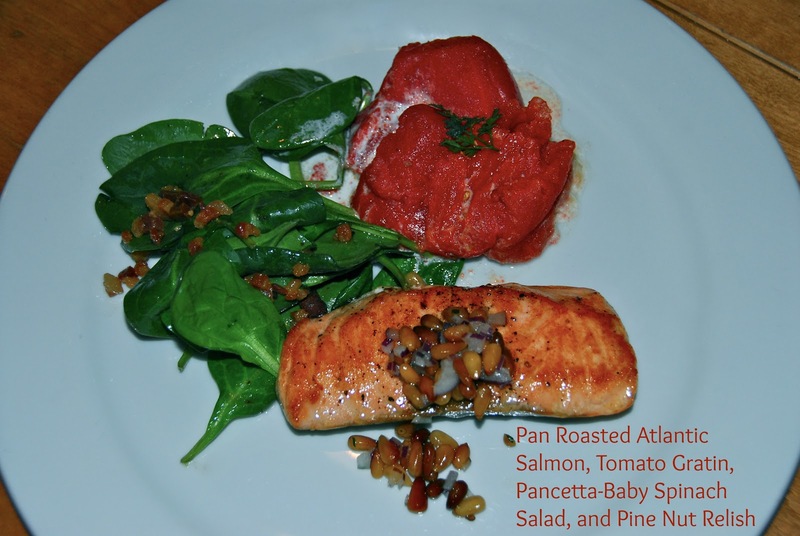 I had the Pan Roasted Atlantic Salmon with a tomato-cheese gratin, pancetta baby spinach salad, and a pine nut relish. I was surprised to see pancetta at a spa, but it was much welcome. It's so flavorful that only a little was needed to give my salad a smoky flavor. The pine nut relish was a perfect addition: it gave everything a nice crunch. 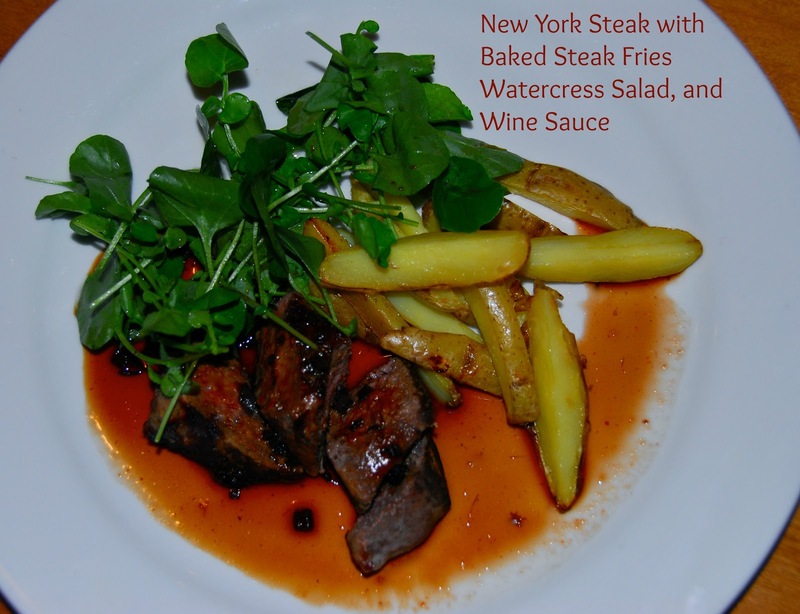 Michael had the New York Steak, which came with oven-baked steak fries and a watercress salad. The steak was juicy and served with a flavorful wine sauce. Although the portion was small, it was full of flavor and quite filling with all the other components on the plate. We couldn't decide which mini dessert to try, so the waiter brought us a sampler featuring all three so we could share. They offered two gluten-free options and each dessert was less then 200 calories. 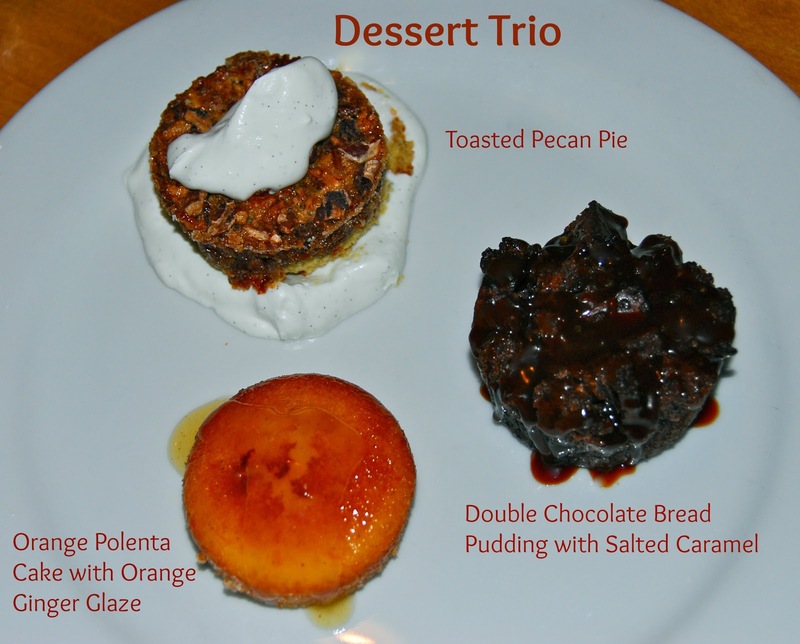 We shared a Double Chocolate Bread Pudding with Salted Caramel (GF), an Orange Polenta Cake with Orange-Ginger Glaze, and a Toasted Pecan Pie (GF). All of the desserts were delicious...and perfectly portioned. After our meal, we agreed we were satisfied without feeling over-stuffed. After dinner, we returned to our cabin to settle in for the evening. We watched the Grammy awards, then we enjoyed a late-night soak in our private hot tub. It was the perfect ending to a relaxing day. After a relaxing soak, we slept like babies in the comfy King-size bed. As I drifted off to sleep, I said to myself that I could definitely get used to this! The next morning, I put on my walking shoes and explored more of the property while Michael slept in a bit. I enjoyed the cool morning air and admired the gorgeous landscaping on the property. After about 10 minutes, I found myself at the Lake House Spa portion of the property. 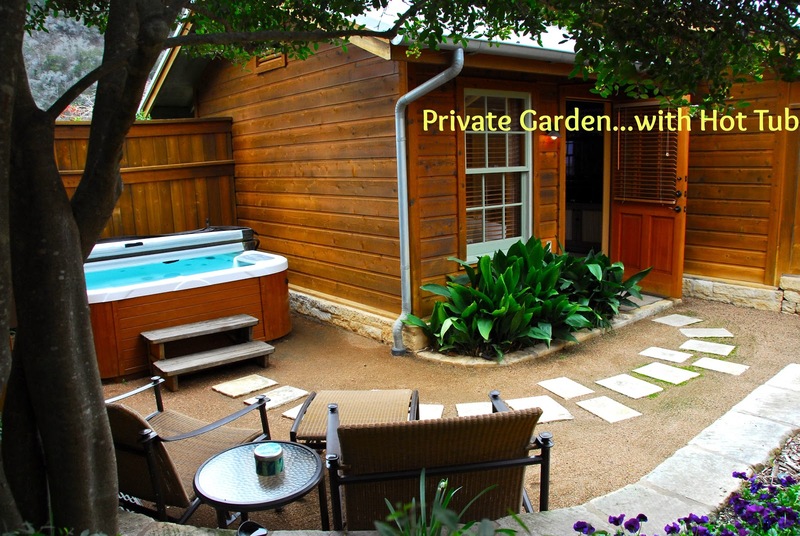 Lake Austin Spa Resort guests use this spa, but it's a day spa open to non-guests as well. 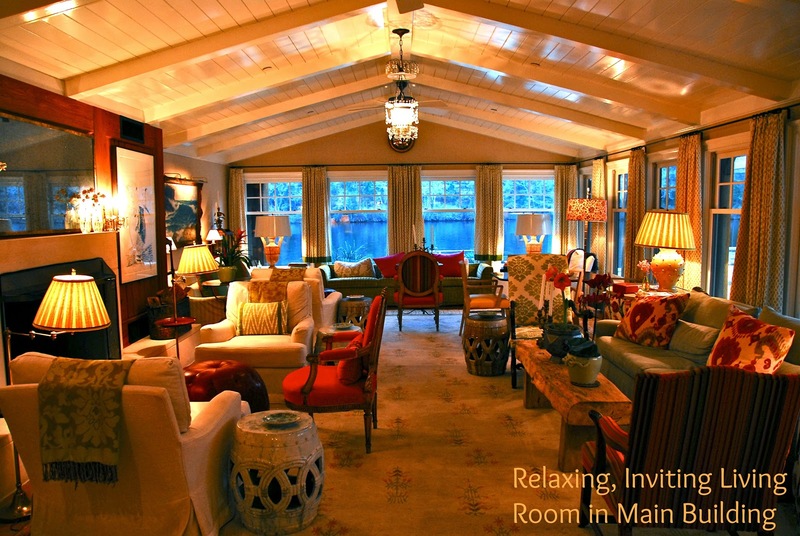 Lake House Spa offers a wide array of spa services and packages, as well as a cafe, a boutique, and a pool area. 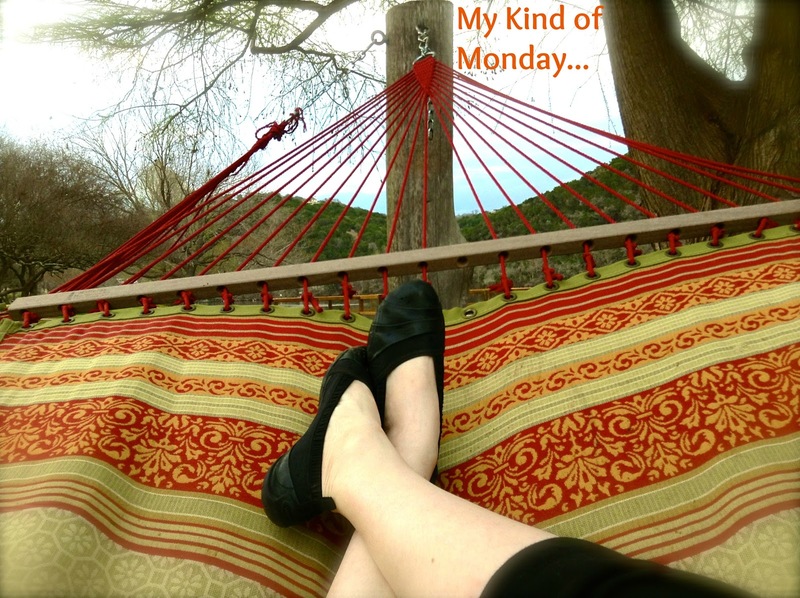 It was almost time for breakfast, so I made my way back toward our cottage...but not before walking down to the lake and kicking back in a hammock for a few minutes. It was so relaxing, and I enjoyed watching a family of ducks swimming in the lake. I'm normally at work at this time on a Monday morning, so I appreciated a few minutes of peaceful reflection surrounded by nature. By the time I got back to our cabin, Michael was up and ready for breakfast. We walked over to the dining room, where we found a mini buffet with oatmeal, yogurt, cereals, and fresh fruit. We made ourselves a light and healthy breakfast. I thought Michael's oatmeal was especially gorgeous with all the fresh berries he added to it. They also offered a menu with various breakfast dishes, but we decided to stay with the fruit, yogurt, and oatmeal combo. We watched our fellow guests enjoy their breakfasts and enjoyed a leisurely discussion about our stay. 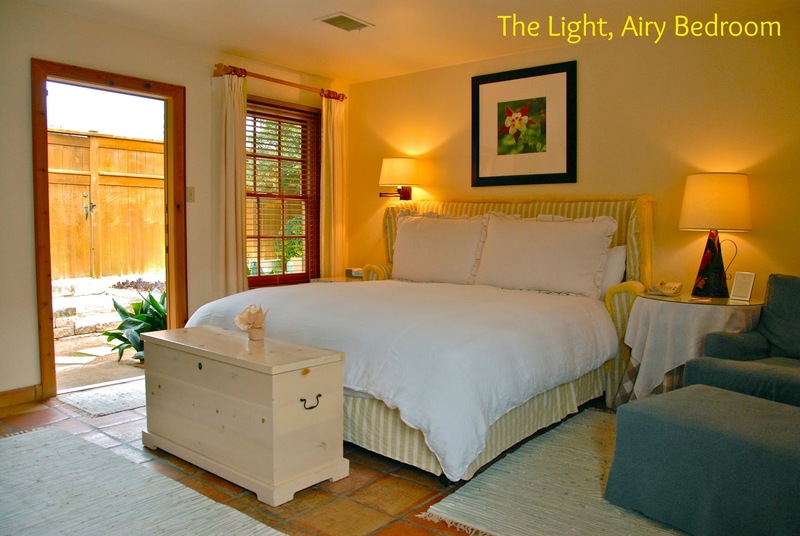 Michael and I agreed that Lake Austin Spa Resort is a fantastic place to get away from it all and soak in natural beauty, along with peace and quiet. 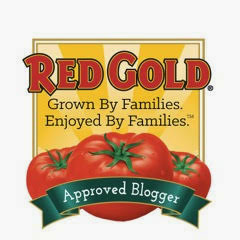 If you would like to inquire about reservations, you can visit their Reservations page. 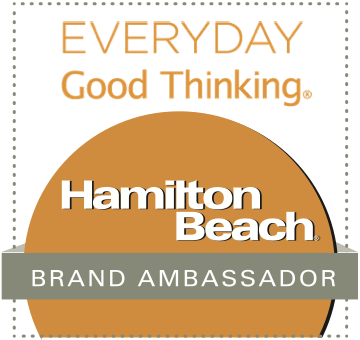 Make sure to tell them that Wendy and Michael from The Weekend Gourmet recommended them to you! Disclosure: We received a complimentary overnight stay, including meals, at Lake Austin Spa Resort to facilitate this post. All opinions are my own, and all photographs are copyright of Michael K. Garcia.